Adidas yesterday announced the rollout of a new space-age soccer ball that knows where it is. 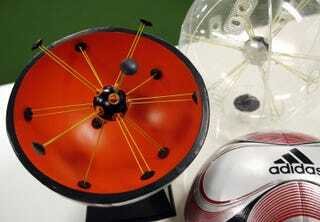 As it rolls around the soccer field, the smart ball uses a magnetic field to figure out its location — particularly when it's near the goal — and relays the data to the referee. No more analyzing footage to figure out what happened: Just ask the ball. That's great, but I want the ballcam, guys. I want to see what your balls see. Sorry, it had to be said. Photo by KEN SHIMIZU/AFP/Getty Images.